Summon: Equip Student of Arms with the highest cost item from your discard pile. Student of Arms is an epic Intelligence creature card. "I will learn by doing." 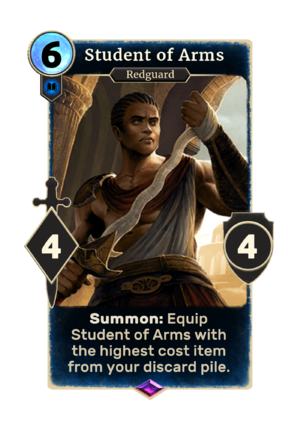 This card was previously part of the training mechanic where it could be upgraded into Master of Arms at level 34. This page was last modified on 16 February 2019, at 16:25.